The third is for editors that need to edit and color at the same time. To that end, Blackmagic is now offering the new DaVinci Resolve Micro Panel and the DaVinci Resolve Mini Panel. Both panels feature “…three exceptional quality high resolutions trackballs, precision machined control knobs, illuminated buttons and much more”, allowing editors to “’hold the image in their hands’ as they manipulate multiple parameters at once to create new and highly stylized looks, or even make very subtle natural changes”. Be sure to also check out the new URSA Mini Pro and Linux version of DaVinci Resolve 12.5 that were also announced in today’s Blackmagic press conference. 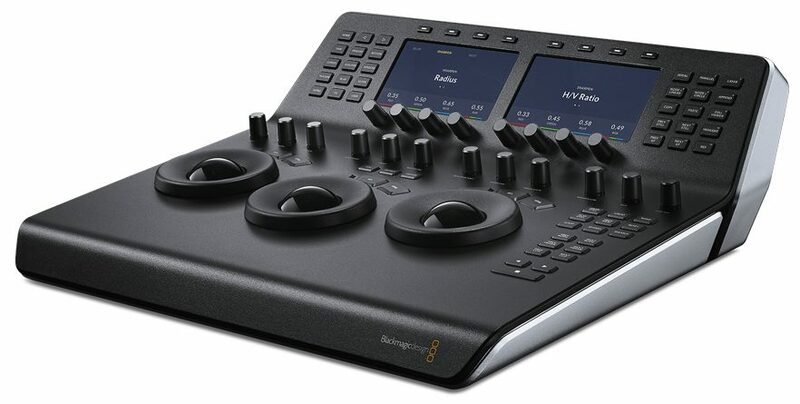 Fremont, California – March 2, 2017 – Blackmagic Design today announced two new portable hardware control panels for DaVinci Resolve, its professional editing and color correction software. With professional editing becoming extremely popular in DaVinci Resolve, these new control panels are designed to allow color correction workflows to be mixed in with editing workflows, while introducing new levels of quality in affordable hardware control panels. The new DaVinci Resolve Micro Panel and the DaVinci Resolve Mini Panel are true professional grade hardware control panels that feature three exceptional quality high resolutions trackballs, precision machined control knobs, illuminated buttons and much more. Hardware control panels are critically important for professional color correction because the colorist needs to “hold the image in their hands” as they manipulate multiple parameters at once to create new and highly stylized looks, or even make very subtle natural changes. The incredibly small USB powered DaVinci Resolve Micro Panel is available now for $995, while the larger but compact and portable DaVinci Resolve Mini Panel with built in LCD screens and dozens in instantly accessible menus is available now for $2,995. When it came to developing these new control panels, the two overriding problems the design team had to solve were workflow and quality. First , there are three workflows that require support. The first workflow is for professional colorists in dedicated color correction suites, the second is for editing systems that change between editing and color, and the third is for editors that need to edit and color at the same time. The first workflow for dedicated color correction suites is already handled by the large DaVinci Resolve Advanced Panel, so the two editing based workflows are the problems the development team needed to solve. The second issue the design team needed to solve was quality. No customer wants a “cheap” low quality panel because they’re going to spend hours working on it every day. While there are cheap panels on the market, what customers need is an extremely high quality panel that’s smaller in size that they can use on these workflows. Also, smaller panels are easy to move between locations and allow freelance colorists to take their own panel as they move between systems and jobs at different companies. This means that quality and durability are one of the most important aspects for these new DaVinci Resolve control panels. The smaller DaVinci Resolve Micro Panel is not much larger than a computer keyboard and is powered from the USB connection. It’s perfect for placement next to a computer keyboard so the editor or colorist can easily move between the keyboard and control panel as they edit, allowing simultaneous grading and color correction. The larger DaVinci Resolve Mini Panel includes the same powerful features but also adds LCD screens with dozens of menus allowing fast access to most of the advanced color grading features of DaVinci Resolve. This makes the panel more suitable for workstations that switch between editing and color correction, but it is still portable enough to be easily moved between workstations around a facility. The mini panel has enough features that a colorist will be able to do professional work on any DaVinci workstation that it’s plugged into. Both the DaVinci Resolve Micro Panel and the DaVinci Resolve Mini Panel provide fluid, hands-on control that allows colorists to be more creative because they can adjust multiple parameters at the same time, allowing them to quickly create looks that are simply impossible with a standard mouse and keyboard. In addition, many clients and DOPs have complained about not being able to achieve “film looks” from digital film cameras. By increasing the access to features in the primary color correction it greatly enhances the subtle creativity that achieving film looks requires. So with the design of these new panels, enhancing the control over the primary color corrector tools was critical. Both panels include a row of 12 knobs that provide access to the most powerful primary correction features, making it easy to experiment and try new combinations. The primary knobs can be used to control Y Lift, Y Gamma, Y Gain, Contrast, Pivot, Mid-tone Detail, Color Boost, Shadow, Highlight, Saturation, Hue Rotation and Luminance Mix. With direct access to dedicated knobs on the control panel for these primary color correction controls, we hope to inspire a new creative revolution in the look of images for film and television. In addition, the new panels have a range of transport and grading control buttons on the right side of the panel that put the most important and commonly used commands at the colorist’s fingertips, so they can work faster without having to hunt through menus or palettes to change a setting. All of the DaVinci Resolve hardware control panels feature a consistent layout that makes it easy for professional colorists to move between the new panels and our traditional DaVinci Resolve Advanced Panel. Many of the controls are in the same position and the trackballs are large and designed with a similar professional feel so any existing DaVinci Resolve colorist should feel completely at home on the new panels. The new control panels feature an elegant and durable machined aluminum body with professional, high resolution balanced trackballs. The trackballs provide RGB balance adjustments for lift, gamma and gain, each with a master level control set via a movable outer trackball ring. The other control knobs are custom designed and precision machined to provide super fine control over adjustments. They can also be pressed to quickly reset a parameter. Illuminated buttons make it easy to see which controls are active, even in a darkened room. The DaVinci Resolve Mini Panel model adds two high resolution screens that display information and parameter settings for the currently selected tool and additional control buttons for DaVinci Resolve features. The DaVinci Resolve Micro Panel is a super small hardware control panel that’s perfect for editing workstations and on-location use. It includes 3 high resolution weighted trackballs, 12 control knobs for advanced primary color correction, 18 dedicated navigation and transport keys, and more. The DaVinci Resolve Mini Panel is a compact hardware control panel that’s ideal for adding color grading to any workstation, and for freelancers that need to take their panel with them when traveling between facilities. The DaVinci Resolve Mini Panel features 3 high resolution weighted trackballs, 12 control knobs dedicated to the powerful primary color correction tools, 18 dedicated navigation and transport keys, and an upper deck with two 5” screens, 8 soft knobs and 8 soft buttons, dedicated keys for switching tools, working with nodes, grabbing stills, navigating the timeline and more. The DaVinci Resolve Micro Panel is available for $995 and the DaVinci Resolve Mini Panel is available for $2,995. Both panels are available now from Blackmagic Design resellers worldwide. Product photos of the DaVinci Resolve Micro and DaVinci Resolve Mini Panel, and all other Blackmagic Design products, are available at www.blackmagicdesign.com/press/images. Jesse Pepin’s CION Experience – Love at first sight..?